It can be easy to discuss fire adaptation only in terms of the problems that need solving: overgrown forests, climate change, the wildland urban interface, etc. In doing so, we fail to recognize the strengths and capacity within our communities that – without the intervention of fire experts or outside funding – make it possible to incorporate living safely with fire part of everyday life. 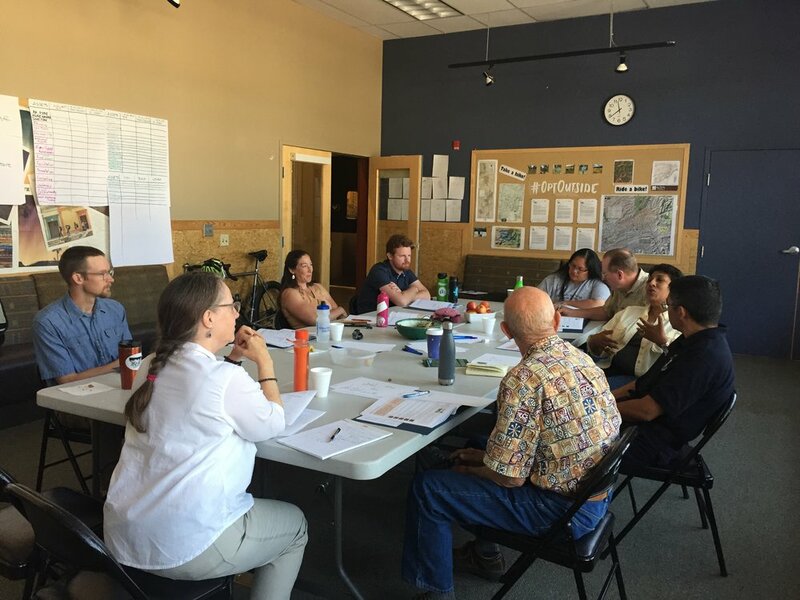 The Mapping community assets to build wildfire resilience workshop, which was held June 26-28 in Santa Fe, provided participants a needed change in perspective from which to approach community fire adaptation work. One that starts by asking communities to plan from a place of strength by identifying their assets and mobilizing them to address their wildfire resilience needs. Workshop participants represented non-governmental organizations, local fire departments, tribal forestry programs, and their communities. The workshop was led by Jana Carp of Community Fire, based in Petaluma, CA. Jana brought over 20-years experience working in asset-based community development (ABCD) to Santa Fe. Over the last two years Jana has worked to bring an ABCD approach to fire adaptation. An ABCD approach to fire adaptation “considers local assets as the primary building blocks of sustainable community development.” This philosophy is right in line with the vision for the FAC NM that recognizes “there is a lot of experience and knowledge in our formal and informal networks” and by offering technological solutions and tools for FAC members to connect we enable greater collective action. Participants identified their assets using an exercise they can bring back to their respective communities. Throughout the workshop, participants explored their own assets and practiced exercises that can be conducted with communities to help them identify their own strengths and capacity. An important thing to remember about ABCD is that no matter what the context, be it wildfire issues or urban community development, community strengths are not limited to what is “typical” for addressing those issues. Having a neighbor with a chainsaw is certainly useful to help reduce hazardous fuel loads, but there is a role for everyone in fire adaptation regardless of their experience in forestry or wildfire. An artist can help design the flier for your community preparedness meeting, the school teacher can help create education materials for the kids in the neighborhood etc. Most importantly, encourage community members to identify their own assets as just about everyone has interests and skills beyond what one might expect. While the workshop provided participants with tools they can use to help communities identify their assets, perhaps more importantly, it helped participants change the way they approach fire adaptation. If we are going to promote Fire Adapted Communities as a way to live with fire, then our efforts should reflect this more positive approach that builds on existing strengths to encourage collective action. Workshop participants agreed to re-connect in September 2018 to check-in and share how they have used what they learned to affect change in their communities. Stay tuned!